Polyclonal antibody raised in rabbit against histone H3 acetylated at lysine 4 (H3K4ac), using a KLH-conjugated synthetic peptide. * Please note that the optimal antibody amount per IP should be determined by the end-user. 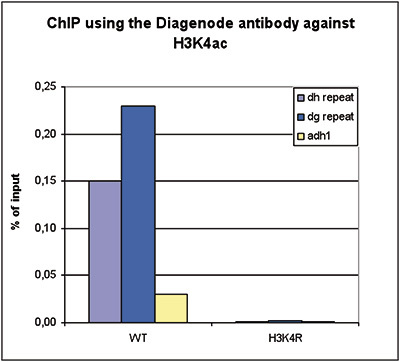 ChIP assays were performed using WT and H3K4R mutant S. pombe cells, the Diagenode antibody against H3K4ac (Cat. No. C15410165) and optimized primer pairs for qPCR. Sheared chromatin corresponding to 10 μg of DNA and 0.5 μg of antibody were used per ChIP experiment. QPCR was performed using primers specific for two different pericentric repeat regions and for the euchromatic adh1 gene. Figure 1 shows the recovery, expressed as a % of input (the relative amount of immunoprecipitated DNA compared to input DNA). To determine the titer of the antibody, an ELISA was performed using a serial dilution of the Diagenode antibody directed against H3K4ac (Cat. No. C15410165) in antigen coated wells. The antigen used was a peptide containing the histone modification of interest. By plotting the absorbance against the antibody dilution (Figure 2), the titer of the purified antibody was estimated to be 1:27,800. 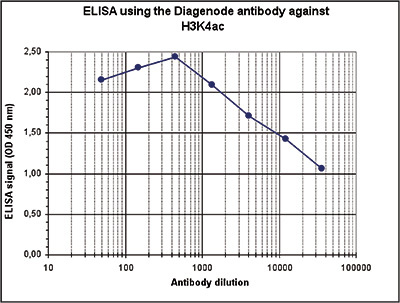 A Dot Blot analysis was performed to test the cross reactivity of the Diagenode antibody against H3K4ac (Cat. No. C15410165) with peptides containing other histone H3 modifications and the unmodified H3K4 sequence. One hundred to 0.2 pmol of the respective peptides were spotted on a membrane. The antibody was used at a dilution of 1:10,000. Figure 3 shows a high specificity of the antibody for the modification of interest. 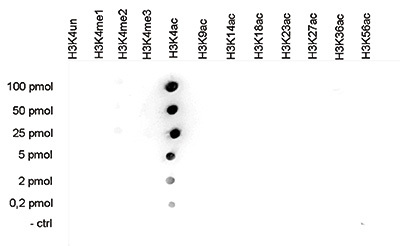 Histone extracts (15 μg) from HeLa cells were analysed by Western blot using the Diagenode antibody directed against H3K4ac (Cat. No. C15410165), diluted 1:500 in TBS-Tween containing 5% BSA. The marker (in kDa) is shown on the left, the position of the protein of interest is indicated on the right. 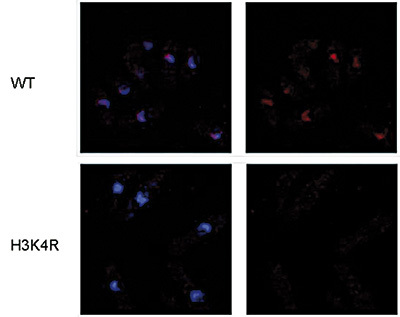 Wild type and H3K4R mutant S. pombe cells were stained with both the Diagenode antibody against H3K4ac (Cat. No. C15410165) (in red) and by Hoechst staining (in blue, left), or with the H3K4ac antibody alone (right). The antibody was used at a dilution of 1:300. 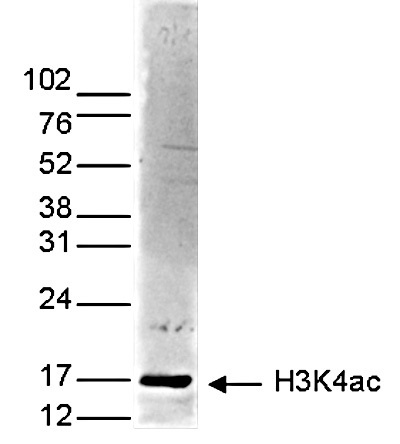 Diagenode strongly recommends using this:	H3K4ac polyclonal antibody - replaced by the reference C15410322 (Diagenode Cat# C15410165 Lot# A482-0042). Click here to copy to clipboard. A chromodomain switch mediated by histone H3 Lys 4 acetylation regulates heterochromatin assembly. Add H3K27me3 polyclonal antibody to my shopping cart.